Failing. It sounds so dreadful, doesn’t it? Remember in elementary school how the grading system was based on the letters from the alphabet? A, B, C, D, skip the E…and right into F. The big “F” standing for “FAIL”? I don’t know about you, but if I received an “F” and failed anything back then, I was delivered a punishment. I was grounded, all sugary snacks were withheld, and an early bedtime was initiated until I could bring that grade up, a simple symbol of me not failing. Even though as a child I received negative messages for “failing,” I learned as I grew through the years and the tears that “failing” is actually valuable and a very important, positive part of being healthy and certainly having a healthy practice. 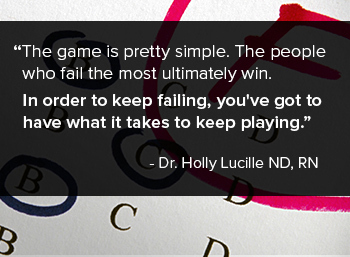 Dr. Holly Lucille is a licensed naturopathic doctor, educator, natural products consultant, and television and radio host. She believes in the science, art, and mystery of healing and has a heartfelt passion for the individual wellness of all people. Built on this foundational belief, she uses the magnificence of multiple media platforms to truly make a difference and empower people to heal. Dr. Lucille’s private practice in Los Angeles, Healing from Within Healthcare, focuses on comprehensive naturopathic medicine and individualized care.